The Foothillers got back on the right track in the win column after losing their previous two league contests which included a wacky game this past Friday against Santana. For Grossmont Kati Contreras (2-4, R, RBI, HR) hit a solo home run in the top of the third inning over the center field fence to make it 1-0. The Highlanders in the bottom of the inning would threaten with two outs as Erin Brown (1-2) singled and McKenzie Flores was hit by a pitch by Samaria Roope would get out the inning. Grossmont would extend their lead in the top of the fourth as Candace Henderson (2-4, R, RBI) led off with a single, she would later score on a Katie Appenzeller (1-3, RBI) base hit to make it 2-0. In the top of the fifth for the Hillers, Rainee Foster (RUN) would come into score on a Henderson single to left field and Jordan Brown (RUN) would come into score on an error by the Highlanders which rounded out their scoring. 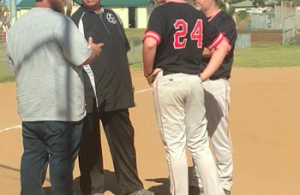 Again the Highlanders threatened in the bottom of the fifth as Avery Perez (1-4) laced a single and Brown walked but once again Roope retired the next batter to end the inning. 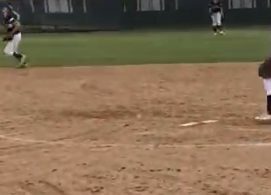 Roope on the day for the Foothillers went 7 complete innings for the victory only giving up 5 hits while walking 1 and striking out 4. Zoe Kulhken for the Highlanders took the loss going 7 innings in which she gave up 4 runs of which 1 was earned on 7 hits while walking 4 and striking out 7. The Sultans who were coming off a crazy victory on Friday made another and once again they won the contest with a flair for the dramatic as Ashley Madrigal (1-4, R, RBI, HR) with the score tied at 1-1 in the bottom of the ninth hit a ball to left field that went for an inside the park home run to give the Sultans the victory. 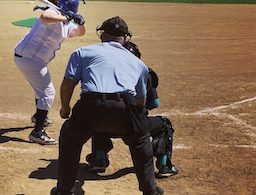 With the pitching on both sides of the circle strong on the day, runs would come at a premium. Santana would strike the first blow in the bottom of the first inning when Madison Mendez (1-3, R, RBI, HR) crushed the Medina offering over the left field fence to make it 1-0. Neither team was able to produce anything offensively. 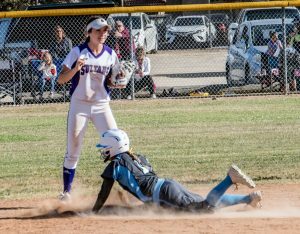 However, the Sultans were given a golden opportunity in the bottom of the third as Natalie Sims (1-3, 2B) led off with a double and Krysten Service followed with a walk. Unfortunately neither would score as misfortune occurred. 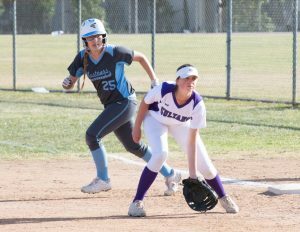 Otay Ranch finally broke through in the top of the seventh with two outs as they were able to tie the game on a base hit by Kameryn Ishikawa. Medina for the Mustangs would end up taking the loss going 8 innings, giving up 2 runs of which both were earned on 4 hits while walking 5 and striking out 6. Starting for the Sultans was Joey Barkhimer who ended up with a no-decision as she went 7.1 innings, giving up 1 run which was earned on 7 hits while walking 4 and striking out 8. Coming into relieve and garnering the victory for the Sultans was Mendez who went 1.2 innings and struck out 2.